The conglomerate is broadening its expertise in an area of Pentagon interest. Textron (NYSE:TXT) is adding robotic land vehicles to its portfolio of autonomous air and sea vessels, part of the industrial conglomerate's plan to build its military business by expanding its capabilities in an area of growing Pentagon interest. The company on Oct. 25 announced plans to buy Howe & Howe Technologies, a Maine-based private company with 13 years of experience in robotics. Terms of the deal were not disclosed, with Textron planning to add the business to its existing military-focused systems division. Howe & Howe is a manufacturer of a line of unmanned ground vehicles including a firefighting robot and a medical transport vehicle. Several of the company's vehicles have been evaluated by the U.S. Army, including the RS2-H1 transport capable of carrying a payload of more than 400 kilograms (882 pounds) that could be used in logistics and combat roles. A Howe & Howe unmanned ground vehicle in a military demonstration. Image source: Howe & Howe. The company's vehicles could also be of use to thwart improvised explosive devices via a rake attachment, and Howe & Howe has also worked with prototype vehicles mounted with machine guns. Howe & Howe robots have also made appearances in movies and on television. Its Ripsaw vehicle was featured in the 2015 film Mad Max: Fury Road, and the company's products were featured on a Discovery Channel reality television show in 2010-11. Textron is no stranger to autonomous vehicles. Its Shadow 2 scout drone has more than 1 million flight hours in service with the U.S. Department of Defense and allies. Textron also has a contract to build two crewless robotic speedboats to be used in coordination with manned vessels on minesweeping missions. Lisa Atherton, president of Textron Systems, in a statement announcing the Howe & Howe purchase said the deal reflects the company's belief that Pentagon spending on autonomous vehicles is likely to increase in the years to come. "We are clear on the U.S. military's vision and their future technology needs for autonomy, robotics and unmanned systems," Atherton said. "This planned acquisition demonstrates our commitment to our U.S. military customers and an understanding of their critical work." Indeed, Textron's investment seems to pair nicely with a push by the Army to explore robotics. The Army's capabilities development and integration directorate, according to a recent report on Military.com, has recently teamed with the National Advanced Mobility Consortium to develop autonomous systems that can be used to help coordinate precision strike operations. The Army hopes to identify and help develop tools that could work side by side with warfighters to assist in military engagements. Robotics could also be used to provide commanders and troops on the ground with better battlefield vision, given that it's safer to send a robot armed with a camera into a contested area than it is to send a soldier. The purchase comes just days after Textron reported third-quarter results that emphasized why the Pentagon is so important to the company. Textron, a somewhat quirky conglomerate that makes everything from snowmobiles to military helicopters to golf carts to business jets, failed to meet investor expectations due largely to issues with some of its off-road vehicle lines. In addition to the systems division, Textron also owns iconic helicopter maker Bell, which is currently involved in a number of military competitions including a new troop carrier, and its airplane division has developed a propeller-powered attack plane currently being evaluated by the Air Force. Military work at times can be tedious, as the business is overly reliant on a single customer and contracts can be spread out over numerous years. But it's also more predictable than consumer-focused businesses, such as all-terrain vehicles, and less cyclical than business jets. 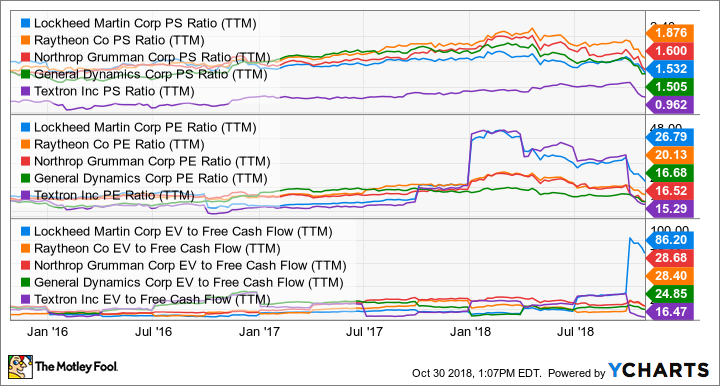 Textron currently trades at a discount to major defense contractors in terms of price to earnings, price to sales, and enterprise value to free cash flow, among other metrics. Defense and Textron ratios data by YCharts. The U.S. government accounted for 22% of Textron's $14.2 billion in 2017 sales, with other military customers responsible for an additional 7%. There's no guarantee Textron's valuation will soar if military sales climb to a higher percentage, or even any guarantee that autonomous vehicles like the ones made by Howe & Howe will ever become big-ticket items for the Pentagon. But investors should be pleased with the direction Textron's portfolio is headed. Moves like the Howe & Howe purchase are not going to move the needle on earnings any time soon, but do add to a promising military pipeline that makes Textron a good buy-and-hold candidate for long-term investors.